Our interests are centered on the application of Nuclear Magnetic Resonance (NMR) spectroscopy to the study of protein and nucleic acid structures. Recent structures include peptide mimetics of Nerve Growth Factor, and a peptide binding domain (PDZ domain) involved in signal transduction. 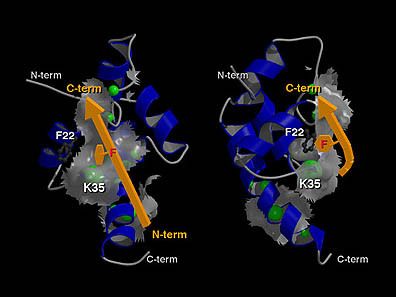 Currently, we are studying several new systems including a protein homeodomain that forms a ternary complex with DNA and a peptide co-factor and a nucleotide exchange factor involved in protein translation. Our laboratory combines techniques from chemistry, molecular biology and bio-informatics in the quest for a deeper understanding of molecular recognition in biological systems.